Who can honestly say that they saw this day coming? Not anyone in Seattle media, or even in Mariner fandom. No, not Derek Holland nor the Texas Rangers. Nobody could have even imagined that the Seattle Mariners would score 21 runs in a game versus the Rangers. Today, it happened. The Mariners scored 8 runs in the second and sent Holland to an early exit. They came up in the third and went right back to work and scored another 8 runs off of Yoshinori Tateyama. Two innings, 16 runs and the M's were on their way one of the best offensive performances ever. Kyle Seager would lead off the 3rd with a double and Jesus Montero would walk and it looked as though the Mariners were going to just keep on putting runs on the board, but Smoak struck out and Alex Liddi hit a sac fly after Seager went to third on a wild pitch by Mark Lowe. One run was all they got in the 3rd, the score, M's 17 - Rangers 0. The Rangers tried to make a game of it by scoring 5 runs in the bottom of the 6th and adding on two more in the 7th to make the score 17 - 7, still a 10 run deficit but the Rangers are more than capable of a 10 spot at any time. Blake Beavan surprisingly pitched through 6 innings, but after giving up a 5 spot he was done for the night. Sitting through two very long innings, I assumed Texas was going to score some runs off Beavan. Our offense did more damage in this one game then they have in over a month, combined. That may be a stretch, but we've really been struggling. Justin Smoak has been on a tear as of late however, and today it continued. 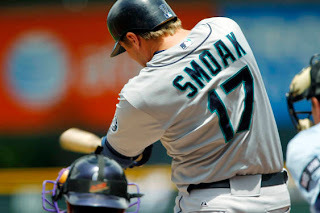 Smoak hit a 3 run homer in the 3rd, a three run homerun in the 8th for a total of 6 RBI. Along with that, he hit a double and also walked in the 2nd inning, all against his former team. Today was the first day that superstar Ichiro Suzuki was held out of the lineup and the M's took that opportunity to go absolutely crazy offensively. I don't say that because I think it has anything to do with Ichiro being out of the lineup, I say it more to just say it and make you think it may have something to do with it. Seager who took his spot in the batting order went 4 for 6 with 2 RBI and 4 runs scored to more than outdo Ichiro's numbers. Chone Figgins took over for Ichiro in right field and had a bit of a shaky time out there while going 1 for 5 at the plate and striking out twice. The rest of the team, amazing! a-Flied out for Liddi in the 8th. b-Popped out for Ryan in the 9th. What a great day to be a Mariners fan! Taking two out of 3 from the Rangers for the second time in a row and bringing this type of offense to Chicago to face a team that has now won 8 straight games. If we can keep hitting like we did tonight, we would never lose again. Not that I would anticipate that happening, but man would it be awesome! Have a great night Mariner fans and we'll see you tomorrow!